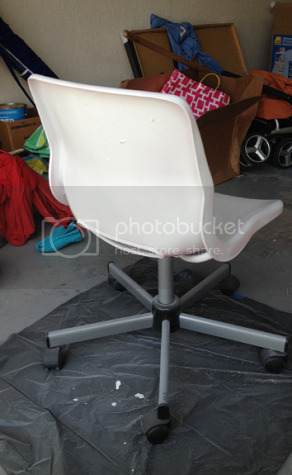 It all started with this $5 chair from Goodwill and a can of white spray paint. 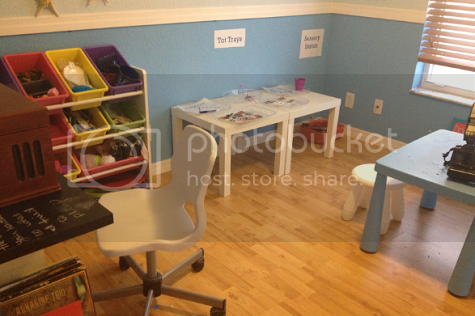 ...And then our tot school space was subjected to another makeover. 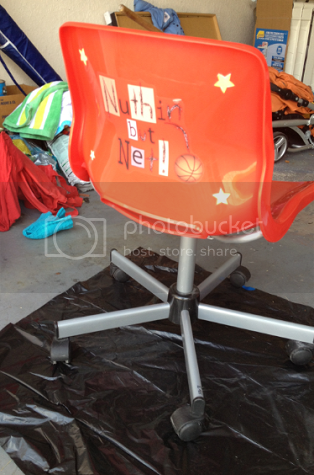 The truth is, I've been dying to redo our tot school classroom. It was getting pretty cluttered and half of the room was taken up by our huge Ikea bookcases that were sort of obsolete at a time in my life where I no longer have the luxury of reading and rereading hundreds of books over and over at my leisure. I found the bookcase a nice new home and started on my quest for decluttering the room and finding a space for everything. 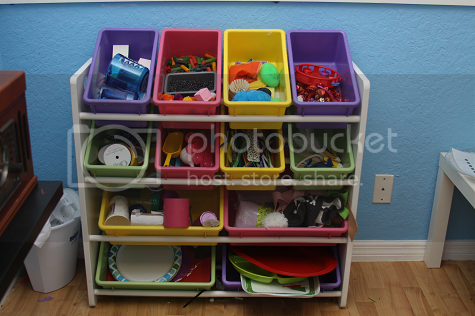 Prior to the redo, we'd been having to store a lot of our centers and tot trays on the floor which was never a good mix when coexisting with a toddler and four cats. I wanted to showcase the room's actual beauty and being -- removing the foam tiles to show off the wood floors, for example -- and keep everything simple and functional. It's amazing how time consuming 'simple and functional' can be. In addition to my sweet Goodwill chair find, I also scored this little table. 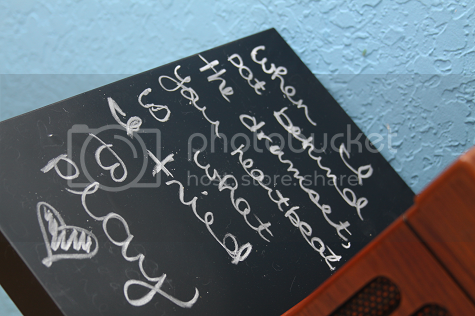 I painted the top in chalkboard paint and set it up to be Ethan's new music nook. Music is a huge part of our lives and something Ethan absolutely loves. 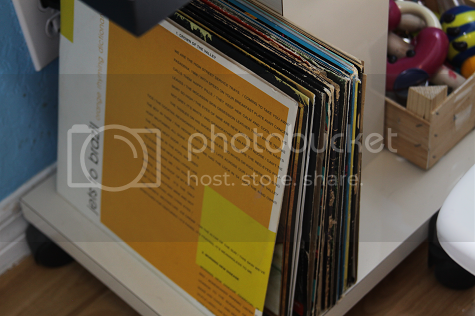 During our music time, Ethan chooses some records and we play along with the instruments in his little basket. 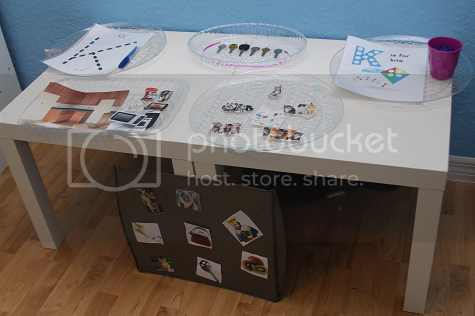 Everything fits beautifully on our new little table! 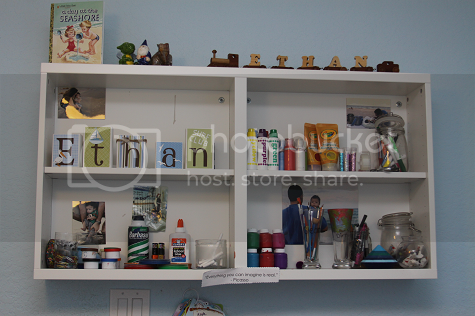 Above our music nook is our art shelf which houses all of Ethan's art supplies. It felt therapeutic to do an inventory check of what needed to be refilled, replaced or tossed out and keep everything fresh and ready to go! These storage shelves are the same, only a little bit more organized. They're filled with little odds and ends we use frequently in tot school, like scoops and spoons and tongs and construction paper and paint dishes and magnet tape and dyed pasta...et cetera. It's always nice to have everything in one place. 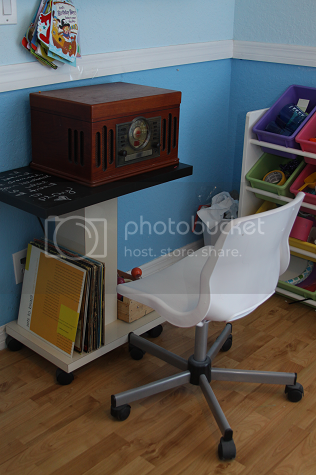 When we first purchased our home, we bought these tiny tables from Ikea and I ended up moving them out into the garage to create a playroom for Ethan. 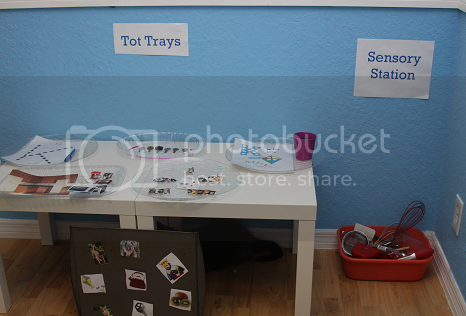 I'm glad we never got rid of them because I turned them into a place to house Ethan's tot trays at his level (rather than on the floor or up on a shelf where they had been) and I love this new addition! 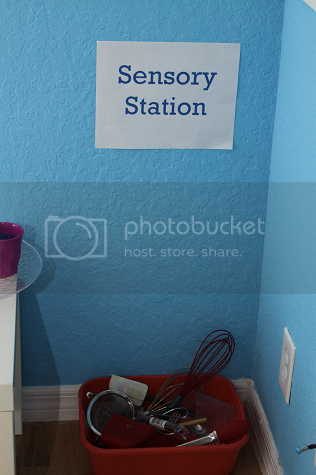 Next to our tot tray tables is our sensory station, which is new. I try (try being the keyword) to create a relevant sensory or discovery bin for each theme we're learning. This gives me a great place to keep one when one exists. I also found this beauty at Goodwill and for four bucks, couldn't pass it up. 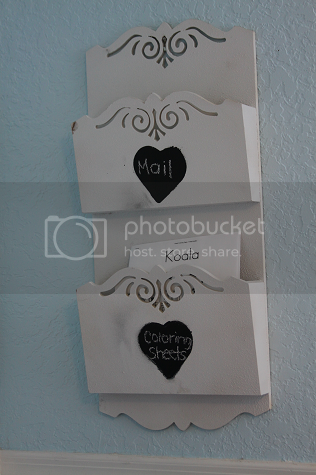 It was actually brown and peeling and really ugly before I spray painted it white and then used cookie cutters to chalkboard paint on some hearts. This gives me a perfect place to store Ethan's coloring sheets to match each week's theme and a place for him to keep mail. He's really into sending mail these days and we typically mail out his letters once a week. This gives us a great place to keep it all! 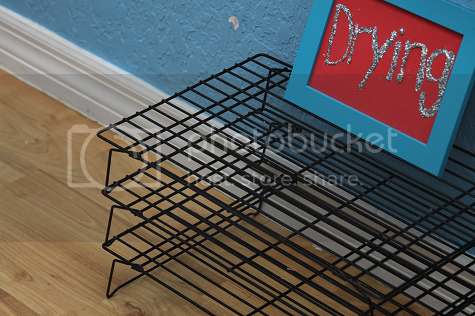 The last thing I added were a few baking racks to serve as art drying racks. I'm pretty excited for our new tot school classroom. 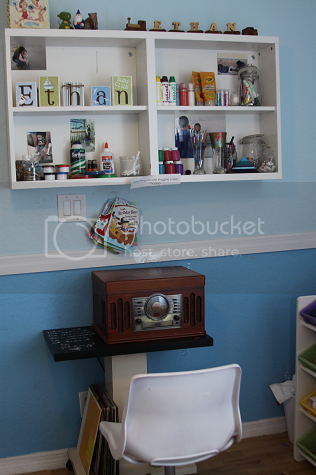 It feels more classroom and less playroom -- and also a lot more grown up than before -- which is what I was going for. I cannot wait to kick off K week in our new space! I am so envious of this room! It helps only having one little one -- when we have another one day, the room is going to have to become a bedroom and it'll be time to makeover tot school somewhere else -- again! It's always a changing tot school place, haha. Such a great space! You did a wonderful job! The room looks awesome. 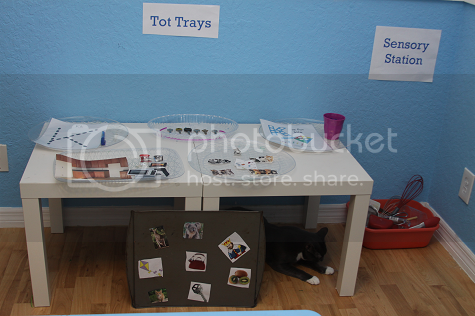 I love how you used those little tables for the tot trays. Thank you! I'm so relieved I still had those little tables in the garage! What a great job. It looks wonderful. Now just to play and learn in it. That will be awesome. Following you at Sun Scholars. Looks great, Mama! It's funny how a "new" space makes everything so much more exciting! I know you guys will have tons of fun in there! It's so funny and so true! I feel like I have to just redo things every once in a while to keep it fresh and fun! Thank you! I do feel TOTALLY revitalized. We've been having an insane amount of fun in our new room already. It feels good to be back, and in a fresh new space! That's awesome, and I totally agree! Changing things up is SO much fun! Wow a beautiful school room! 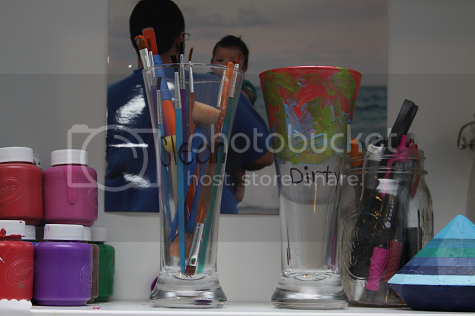 :) I love all of the different areas. 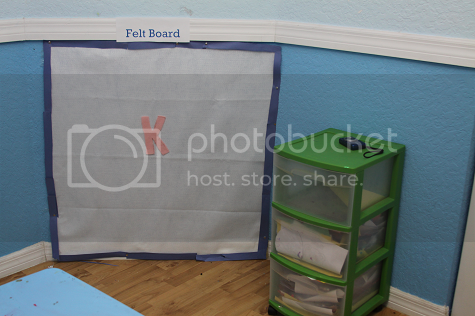 The felt wall is just great, as is the music center!